Music Costs > How Much Does a Violin Cost? A beginner’s violin, one that can be used for a child to learn how to play, can cost $50 to $500. For example, the ViolinSmart Student violin will cost $55, while a violin such as the Cremona SV-1240 Maestro First Violin will cost about $400. A violin that is designed for a child can range anywhere from $50 to as much as $250. Most children packages are going to come equipped with both the bow and case. Intermediate violins, used for the older and more serious player, can cost $500-$3000. The Regina Carter RC20 Violin, for instance, will cost about $3,000, while the Molinari 406-4 Intermediate will cost about $780. An advanced violin or a rare violin that could be considered a collector’s piece can cost $1,000 to $20,000. These types of violins are usually only for the very serious musician, and the costs will vary depending on the rarity of the violin. The stradivarius violin, for example, cost $45 million — making it the most expensive violin ever sold. An electric violin can cost $200 to $4,000 depending on the design, manufacturer, and features. The NS Design CR5 violin, for instance, will cost about $2,300. For those that want to rent a violin, the cost of renting one can range from $15 to as much as $50+ per month depending on the brand as well as where it’s being rented from. According to the website ChildrensMusicWorkshop.com, the cost of a European violin outfit should range $650 to $850. A step-up instrument used by professional players should cost anywhere from $1,000 to $5,000. The violin you purchase should have new strings and should be tuned. Some violin purchases come with a carrying case. Violins will usually come with a simple bow for playing. Common sizes for a violin are going to include sizes such as 1/4, 1/2, 3/4 and full. Other sizes may include 1/8, 1/16 and 1/32. A violin can be purchased from a big chain store, second-hand stores, a private music store, online or via classified ads. What are the extra violin costs? If you are a beginner, lessons may be needed to teach you how to play your violin. A new bow will be needed every so often; the amount of time a bow lasts depends on the quality of the bow and how often you play. A bow can cost $75 to $200, depending upon the quality. Many players tend to use a music stand, and a good stand can cost anywhere from $50 to $200 depending on the brand. Rosin is recommended for your violin and can cost upwards of $5 to $20. Purchasing a used violin may require new strings, a bridge and bow hair. If this is the case, plan on spending at least $100 to $200 for the repairs alone. If you plan on purchasing an antique violin, you may have to restore it. Depending on the brand, the restoration prices can widely vary. Plan on spending at least $200 for a complete restoration process. If you’re new to playing one, highly consider renting one before making a purchase. Renting one can cost as little as $20 and can give you a rather good feel for how one is going to play. If an older violin has broken down, don’t get it repaired just yet. You may find that it’s cheaper to invest in a new one rather than fix the one that you have now. A used violin can often sound better than a new. Many teachers have stated that a used violin will often be “broken” or “played” in. As they are played, they do start to sound a lot better. If purchasing used, though, just make sure that you’re buying from a reputable dealer. Local violin shops are more than happy to discuss potential violin purchases. Bring them in a picture or a potential description of a used violin you’re looking to buy. For a small fee, they will be more than happy to discuss the value and if it’s worth the investment. This is a popular question that often arises online. While the answer may be nothing. A fiddle is typically played with folk/traditional genres, while a violin play composition-based genres. There are some differences, however. The name “fiddle” and “violin” refer to the non-changeable parts of the instrument, and many fiddlers will prefer a different setup to a violin. This setup may include the strings, tuners and the bridge. Another difference may be the strings. 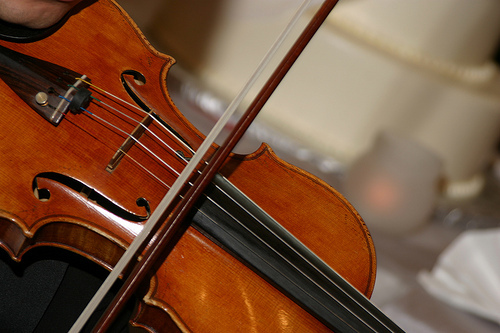 While five-string fiddles do exist, there are others with different arrangements on the market; however, your standard fiddle will have four strings. All in all, a fiddle is a nickname for a violin. Examine the violin before purchasing. Since the body is made of wood, it’s important to see how it’s been affected by the environment. Check for cracks or water damage. It’s also important to inspect the wood for any type of curling. Try to find a reputable music shop that will help you with a setup. Many shops will just rely on a warehouse to help with this. This is something that you would want to avoid. There are many ways to purchase a violin. A local music shop, website or mail order company can all offer a great selection. When choosing one, try to test it out in person. Also, it doesn’t hurt to consider a purchase in person. That way, you can ask questions and have a contact just in case something happens in the future. Used violins can be purchased through Amazon or your local music store. Be careful of the condition when purchasing these since sometimes, buying a used violin could more expensive than simply buying a new one. By purchasing used, you can save up to 50 percent. Remember, purchasing a used violin can be a good thing. If you are unsure about you or your child’s commitment to playing the violin, one can be rented while learning how to play. Rentals will usually just require a monthly commitment. If you plan on renting, try to find a program that allows you to place a portion of your money toward an initial purchase in the long run. Don’t spend too little on a violin. Experts will tell you that any violin under $200 usually isn’t worth the purchase.